Six days. That’s how much longer we have here. Six more quiet mornings with the sounds of Thrushes and squirrels in the woods. 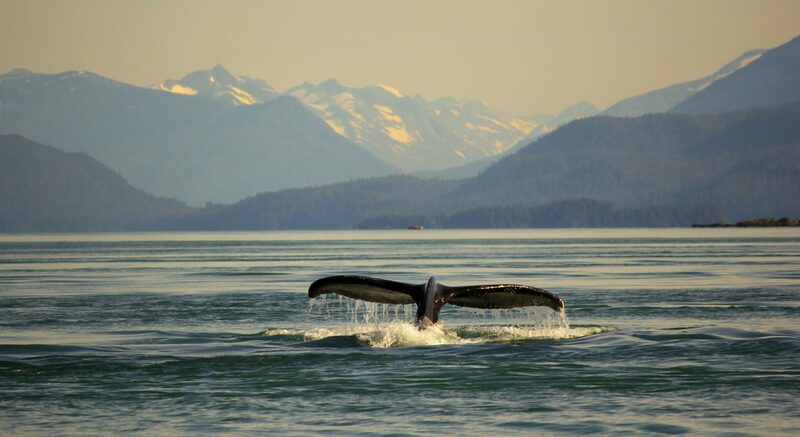 Six more nights of boat noise as tugs and fishing boats crawl up and down Blackfish Sound. I am acutely aware that I’m doing things for the last time. A final round with the chainsaw, a final walk through the woods, a final trip down the strait. My last boat ride to the lab was yesterday. A moderate westerly beat me up as I went into Alert Bay. So instead of taking my usual trail that weaves through the Pearce and Plumper Islands, I took the more exposed route through Johnstone Strait. The sun shone from a brilliant blue sky, the strait’s southern side turned a deep green as the forests of Vancouver Island reflected across the waves. Looking down the strait there was no sign of human life. No boats, no houses, no cell towers. Just mountains, water, and trees. As it had been for centuries. May it always look the same. It may seem weird to have a nostalgic stretch of water. But this run from Alert Bay along the strait and to the lab does for me. It’s the route I took the first time I came here. I was packed on the June Cove with four other volunteers and Paul. As the June Cove notoriously does whenever I arrive, it wasn’t working too well. We puttered along the strait at six knots, anything faster and the engine would cut out. I had no idea where we were going or how long it was supposed to take. So I put my trust in the cranky engine and sat atop the the cabin to watch the mountains of Robson Bight slowly grow taller. I moved faster yesterday, whipping across the south end of Weyton, dodging driftwood and willing one more dorsal fin to break the water. I came here hoping, maybe even expecting my dedication and effort to be rewarded with magical and unforgettable Orca encounters. After nearly 24 cumulative months here I’m still waiting for my “Free Willy” moment. But now I don’t expect it to happen. And just as important, I don’t need it to. Proximity doesn’t equal intimacy. Three years on a whale watching boat will teach you that. During that first boat ride in 2008 I rode through the world oblivious. I had no concept of Climate Change, no understanding that Canada was in the cruel grip of the Harper Administration, a manifestation of the, “if it can’t be grown it must be mined,” ideology. All I knew were Orcas and that captivity was bad. As far as I was concerned, that was the only environmental movement that mattered. Now the uncut portions of Hanson Island feel like a miracle. The thousand year old Cedars a symbol of hope instead of a novelty. I love this place fiercely with some protective parental instinct. It’s hard not to take every threat and oil spill personally. The boat flashes along the Hanson shore. Somewhere on the beach are First Nations artifacts. According to Walrus, the anthropologist who lives in the woods near us, there is a rock carving of Raven the creator hidden somewhere on the beach. It aligns perfectly with the sunrise on the winter solstice. I’d considered trying to find it. But what is man’s insatiable desire to see and touch everything? To literally leave no stone unturned? I like the idea of just a few people knowing where it is. The knowledge that it exists is enough for me. In an age where we move with such haste to smother the world with concrete and progress, some mystery is a good thing. At the east end of Hanson is a pair of tiny islands. Coveted by kayakers, the pass between them is plenty deep for a small boat. Protected by both the east and west winds, the channel is the perfect hovel for sea birds. Harlequin’s adore it, as do the Mergansers and Herons. An eagle’s nest adorns a Cedar tree on the northernmost tip and offers a view of Blackfish, Blackney, and Johnstone. This confluence brings life. The mixing and upwelling of currents traps food and brings cold, nutrient rich water to the surface. It draws herring, salmon, eagles, gulls, ravens, crows, humpbacks, salmon, seals, sea lions, Orcas, and Me. It’s a powerful stretch of water with the ability to change lives and send them careening off the tracks into the unknown. It threatens our existence, and makes us question why we’re here and what matters. Anyone who does not feel their heartbeat quicken as a Humpback roars through a bait ball while gulls circle overhead has no spirit. The boat turns left and for the first and last time, I lay eyes on the lab. Smoke curls out the chimneys and wraps their wispy fingers around the trees like the fingers of a lover. The lab deck hovers over the water on the high tide. Here one can learn to love without intruding. You have to let go, be contented with watching those black fins disappear around the corner, accept that there are more important things than getting as close as possible. The trees mute the sun and the cove shines like a sapphire in the evening light. Harlequin’s scoot across the bow with indignant squeaks. The engine dies and I step onto the beach for the first and last time, eyes wide and mind open. It’s good to be back. I squirm and fidget in the plastic seat, trying to make my life jacket sit against the combing. Again and again the jacket slides up. I give up, letting the combing press against my lower back. It doesn’t matter. Bartlett Cove is paper flat. Clouds are thrown across a deep blue sky at random. The only sound is my paddle in the water. Glacier Bay. I’d tell you to never change, but change is all you do. On days like today I stop just beyond the dock. I look out into the mouth of the cove and drink in the lower bay. I stare out into Icy Strait, at the islands of Lemresier and Chichagof. I feel my heart slow down, my chest inflate, my body at peace. It’s a sensation that only a kayak can bring. Maybe it’s the angle, seeing this place from the vantage point of the Murre and Murrelet, otter and sea lion. Perhaps it has something to do with the knowledge that it is up to you and not diesel fuel and outboards to get where you want to go. Or maybe it’s something deeper. Something buried deep within our chromosomes. A treasure within each of us, waiting to be discovered. Whatever it is, life is different from the seat of a kayak. It magnifies the soul while reminding you how small you are. What a wonderful reminder. There are no advertisements, no one telling you what you deserve or what you need. What you need is all around. Beyond Lester Point the upper portions of Glacier Bay come into view. The east and west arms beckon. A labyrinth of tide rips, adiabatic winds, and endless waves of mosquitoes await. Come on in. But leave security and your ego at the door. Leave your boots on. Keep your eyes open. Breath deep. Be free. Some of the most memorable moments of my life have happened here. Just off the shore of Lester and Young Island. They’ve chiseled me like a piece of wood. Sculpted and refined me. A project never finished. There was the day the sea lion surfaced a foot behind me. That cunning, malevolent look in his eye, teeth curled into a snarl. He still gives me the shivers. Still makes me tense when a sea lion approaches. Orcas in the middle of the channel. The perfect end to the perfect day. A humpback in the mist, the sound of his breath reaching out through the infinite nothingness. A siren, beckoning me closer. If I dare. Swim with me. Commune with me. Guess where I’ll be next. Take another shifty look beneath your paddle. Look for my shadow. The humpbacks. Too many memories and stories to retell them all. Such a simple question in theory. But mere numbers cannot begin to convey what it feels like to watch the water come alive. To watch it quiver as the head and back of a 40 ton creature breaks the surface ten feet away. To describe the simultaneous rush of euphoria and terror. Your gut screaming for you to run and to stand still. How three seconds can last lifetimes. What it’s like to watch a tail as wide as a Cessna break the surface. The sound of rushing and dripping water. And than… gone. Just like that. No trace, no markings save for some rippling water. It defies description. How does something so big just… disappear? Somehow, through the beauty and grace of the universe, this became my job. To paddle among these animals. To learn the tides and eddies as intimately as a lover. And to pass that love on to others. To pull them gently from their comfort zones and into a world that continues to persevere. And above all, to show them that wilderness is something to worship. To love and cherish. That all we need to do is tap into those ancient desires deep within each of us. It’s not something to be feared, for respect and terror are not exclusive. Follow her rules, read her tides, understand her weather, and you will be rewarded beyond your wildest dreams. This is home. Perhaps I cannot trace my ancestry back to the fog choked mountains of southeast Alaska. But I’ll love it as if I can. I am not a brave person. At least, I don’t consider myself one. I rarely feel bold, or filled with valor, or the innate desire to take risks, and stick my neck out. I get nervous walking through the woods in the dark, even here, where there’s been exactly one bear sighting in decades. My imagination, which is often my ally betrays me in these moments. I feel the hair rise on my neck, the goosebumps spread across my body, a spasm of fear running down my legs. I don’t believe in spirits floating among the living. At least, I think I don’t. But the lab is built on the same ground that was once a Namgis summer camp. A small grave was found in the rocks, somewhere near here, the body of a young girl entombed within. That’s what Walrus says. I never asked him where the grave was. I don’t want to know. But it’s much easier to believe in restless spirits, the thrill of the supernatural, the magnification of fear when the dark surrounds you with creaking and swaying trees. Glowing eyes in the dark. Deer, they have to be deer. But what if they aren’t? The water’s rough. The waves roll up on themselves, ringed with foam and frothy white caps like pearls on a necklace. Rain falls as a fine mist. In our tiny boat, the waves roll by at eye level, the boat pitching over the crest and through the trough of each swell. Up and down the hills, again and again. Why does it seem like we’re always going into the wind? The water is deep, churning, cold, dark. This seems like a lot of work to go through to run a generator. But such is our assignment today. To cross Blackney Pass for Cracroft Island. To add the magic of unleaded gasoline to help us maintain power at the lab. It’s the same body of water we were crossing when the boat engine died a few weeks ago. And for an hour we were at her mercy. Enough to make you think twice when the land fades away off the starboard side and you begin the mile wide crossing. I’d be lying if I said it wasn’t in the back of my mind, with the waves growing and the ocean soaking our windshield. No boldness or valor or bravery here. Loyalty and dedication maybe. I’m more Hufflepuff than Gryffindor. What would it be like if we lost the engine here? If the boat filled with water? If we had to jump clear, life jackets clinging grimly to our necks? To come face to face with our greatest fear? I’ve never had a near death experience. At least not that I remember, and I’d like to think I would. How terrible and thrilling, to come face to face with my own mortality. Would I be cognizant of my final breath? Aware that it was the last one this body would ever draw for me? Would I watch this grim physical home for my soul drift into the depths as I floated above, great wings growing out my shoulders? Or does everything just go blank? A reel of film that’s reached its end, spinning pointlessly on its spools. But today is not that day. Across Blackney Pass. In the shadow of Cracroft Island, the water is calm, a soothing emerald color. It’s far too rough to land on the rocks by the shelter. So we motor into a quiet cove on the opposite side, out of the wind. Was it really just a year ago that we blazed this trail? Just me, Paul, a couple of hacksaws, and a general idea of what direction to bushwack. By some miracle our zigs and zags led us straight to the CP shelter. We climb onto the bow and tie the boat to a massive log draped across the rocks. I step into the woods and stop. I’m not alone. Something lays on the ground at my feet. A jigsaw of vertebrae and ribs and fur. It’s been dead awhile, the body barely recognizable. The skull lays just off to the side, neatly picked clean as if it were a name tag, identifying the creature to which it had belonged. “There’s a carcass in here!” I shout. Brittney shoves the ferns aside and stops next to me, mouth agape. The smell wrinkles our noses, but neither of us step back. For a long while we simply stare, a silent vigil, disturbers of the animal’s peaceful sleep. “What is it?” Brittney asks. She’s kneeling near the clump of fur and vertebrae, awestruck. She’s neither squeamish nor disgusted but fascinated. Even in death, her compassion for things furry continues. I break off a stick and flip the skull over to reveal the jaw. The mandibles and lower jaw bones are gone, but the unmistakable canines of a predator remain. We let out silent gasps. The wind rattles the tree tops. It’s going to get worse out here before it gets better. I leave Brittney with the departed, and vanish into the woods. The whole way to and from the shelter, I think of nothing but the creature. I’d never seen anything like it, on the day that I’m contemplating my own mortality. It can’t be a coincidence. I return to find that Brittney hasn’t moved. It was a wolf pup she announces with conviction. I agree. What else has teeth and claws like this? We sit in silence, my mind trying to put the wolf back together. “How do you think it died?” Brittney asks. Like the girl’s tomb, I don’t want to know. The ocean is not twenty-feet away. Is it possible that one of my own species is responsible for this? Was this cub the victim of some human’s potshot with a rifle? A vigilante dedicated to predator control? Maybe that’s unfair, but I can’t think of any explanation for how he chose right here to lay down and die. We leave him where he lays, to continue his noble work of returning to the soil, feeding the web of life around him. A sacrifice that won’t go unnoticed. One more stop. Parson Island. The water has settled a bit while we were in the woods. And the journey across Baronet Passage is a calm one. I disappear into the woods and up the hill, one more generator to go. My mind returns to the wolf cub and I feel pity for the little creature, that his life was taken so early. I pray he died right, with honor, dignity. Perhaps he just didn’t want to be a wolf anymore. Was ready to be something bigger than himself. Isn’t that what I want? What we all want? For what is more fulfilling than giving of ourselves to something bigger. To make the world a better place. The land where the wolf lays resting was clearcut some thirty years ago. The land stripped. Every. Single. Tree. No more squirrels, no more birds. No wolves. No cougars. No life. No character. But the land is recovering, like it always does. And will flourish with magnificent old Cedar trees again, if we allow it. Maybe all he wanted was to speed up the process. Infuse the earth with his carbon and nitrogen, accelerate the growth of those great trees so that the generations to come can run and hunt and howl beneath their great branches. I reach the cliff. From here I can see past Cracroft Island and into Johnstone Strait, up into Baronet Passage, out into Blackfish Sound and Queen Charlotte Strait. Pristine silence. Quiet places. Open spaces. The little cove on Cracroft is indistinguishable. The wolf’s resting place invisible, his sacrifice anonymous from here. But I know. Brittney knows. The tree’s know. Sometimes the greatest sacrifice is the one not recognized. I say a little prayer before I pour gasoline into the generator. Before the war cry of my species infects the land. I bend over and pull the cord. The generator roars to life. Without a backwards glance I turn and vanish into the woods. The Cedar and Salal covers my tracks. The growl of the generator echoes in my ears.